The Viking Princess is part of the established Viking Nile Cruises fleet, well known for their warm and friendly service. The stylish decor, spacious interiors and traditional wood furnishings combine to create an intimate ambience. With modern comfortable accommodation and a range of facilities it offers a truly elegant cruising experience. The spacious restaurant serving breakfast, lunch and dinner is situated on the middle deck. The lounge bar offering a range of drinks is a good place to sit and watch the nightly entertainment which includes a traditional belly dancer and Galabeya party. On the large sun deck there is a swimming pool for a refreshing dip during the day and a bar serving drinks plus sun loungers in which to relax and enjoy the beauty of the Nile. *Internet access is available onboard via a dongle which can be rented for a local charge of E£20 per half hour. Please note that the connection is via a mobile signal and service can be intermittent along remote stretches of the Nile. Please note there is a No smoking policy onboard in all the cabins and the Lounge bar. Smoking is permitted in the Reception area and up on the sun deck. 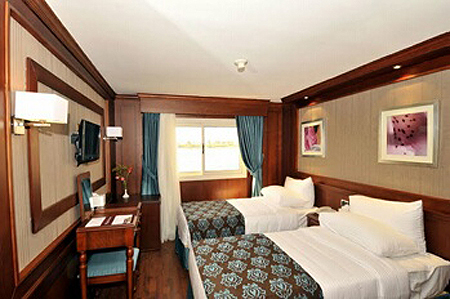 All the 49 standard cabins are reasonably sized and face out over the Nile. Decorated in traditional wood with attractive furnishings they all feature twin beds, air-conditioning, en-suite facilities, hairdryer, mini-fridge, safety deposit box and satellite LCD TV. 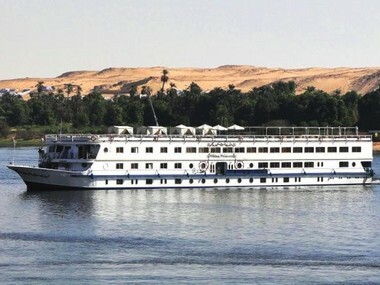 Our Classic Nile itinerary takes you from Luxor to Aswan, visiting some of the most spectacular ancient sites in the world including the stunning Valley of the Kings the burial place of Pharoahs including that of Tutankhamen and the breathtaking temples of Karnak and Luxor. Depart from the UK, fly direct to Luxor. On arrival transfer to your chosen ship (approx 20 minutes) for a seven night cruise. A welcome meeting to discuss the week ahead will take place either this evening or the following morning, depending on your flight arrival time. An early morning start crossing over to the West Bank of the Nile to visit The Valley of the Kings, (for an extra charge you can visit the Tomb of Tutanhkhamun, see your guide for more details), Hatshepsut's Temple, the Valley of the Queens and Colossi of Memnon. (This whole morning tour takes approximately 5 hours.) On arrival back at the boat, a buffet lunch will be served and the boat will sail for Esna. The afternoon can spent relaxing on the sundeck while watching the varied local life on the river and its banks. Afternoon tea will be served on the sun deck. After Dinner, there's a small informal cocktail party where the management of the boat is introduced to everyone. At some stage during the evening the boat will pass through the lock at Esna then dock overnight in Edfu 3-4 hours later. Wake up at leisure and after breakfast, visit the Temple of Edfu. Afterwards, there is time to roam the local market where you will be able to prepare for this evening's Galabeya Party. Back on board the boat lunch will be served as the boat sails to Aswan. This wonderful journey takes approximately 10 hours and gives you chance to take a dip in the plunge pool, read a book or simply to enjoy the view. In the evening there will be a Galabeya party, where everyone dresses up in traditional Egyptian costumes for dinner and the party games. Late that night the boat will dock in Aswan for a stay of two nights. Morning visit to the High Dam, the Old Granite Quarries, the Unfinished Obelisk and then by boat to the Temple of Philae. In the afternoon sail by felucca around Kitchener's Island and its Botanical Gardens. After dinner, tonight's entertainment will be an Egyptian style 'Treasure Hunt'. Today can be spent either at leisure or on optional excursions. The most popular excursion is to the Temple of Abu Simbel which is available by coach (approx £65) or by air (approx £130). In the afternoon an optional excursion to a Nubian Village via camel or boat can be arranged. In the late afternoon the boat will sail to Kom Ombo and a visit to the Ptolemic Temple usually takes place that evening. Dinner, evening entertainment and overnight on board. The day is spent at leisure as the boat heads to Luxor arriving later that evening. After dinner, enjoy the delights of a traditional Belly Dancer. The day can begin with an optional Hot Air Balloon trip giving you a bird’s eye view of the magnificent wonders of the West Bank and the surrounding countryside (approx cost for a 45 minute flight is £70 per person this trip can also be taken on Day 8). Afterwards join a morning visit to Temple of Karnak, the papyrus museum and the traditional perfume shops of Luxor. In the afternoon, visit the Temple of Luxor, afterwards there is ample opportunity to explore the markets of Luxor for souvenirs and gifts. That evening there is an optional excursion to the Sound and Light Show at Karnak Temple. The morning can be spent at leisure or take an optional Hot Air Balloon flight (see above). In the afternoon, disembark and transfer to the airport for your return flight or continue to your next resort.